I visited some friends for Thanksgiving who live in a closed country. While there, I met a man who has recently been saved out of Islam. To hear him tell of the joys of answered prayer made me cry. As a Muslim he prayed 5 times a day for as long as he could remember. Never once did he experience an answer to his prayers. Yet in the first few weeks of knowing Christ as Savior, he has prayed specifically for opportunities to share his faith with others and has seen God answer those prayers within the same day. First, I cry tears of thankfulness because I am thrilled to see his joy and simple faith. But I also weep because his story makes me realize how casually I take prayer and sometimes think God isn’t listening. I had not expected to meet any Deaf while I was there but my friend scheduled a meeting for me with a Muslim deaf man. Though our communication was limited—four deaf men and I played charades for three hours—there is now an opportunity for a return visit and a plan to share Christ with them more directly. Bro. 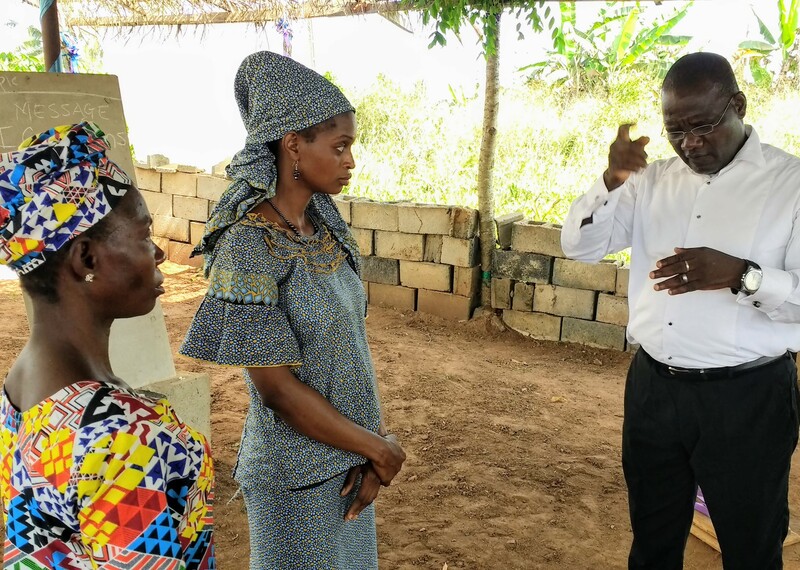 Wale praying with two deaf ladies for salvation. My trip to Nigeria was phenomenal! I went there to be a help and blessing to the deaf churches. But, as is often the case, I think I was the one more blessed. Eight Deaf were saved in six preaching services. But there is so much more to the story than just the numbers. I was in Nigeria nine years ago. At that time I met a hearing missionary, Wale Orekan, who was new to helping the deaf churches. He did not know sign language. He was doing what he could to encourage the deaf believers in the Lord since the recent passing of the founder of their churches. I also met five deaf church congregations who were struggling to keep things running without a clear leader. Most of these congregations had no permanent place to meet. I even met a young skeptical interpreter who had been hired to help the hearing missionary train new church leaders. What I found this trip wast he same hearing missionary who now knows sign language and preaches to the Deaf without an interpreter. I saw the same five deaf churches that now have strong leadership and a permanent church location for their meetings (with the exception of one church that is still looking for land). And the young interpreter that I met nine years ago is now in full-time ministry and has started a new deaf school this year as the basis for the church congregation that he is assembling to lead as pastor. God is doing a great work in the world! I thank you for allowing me to be your eyes and ears to see what is going on and reporting back to you. It is a privilege to serve you in this way as I serve the missionaries on their respective fields. You can download a PDF version of the letter for printing. NOTE: I have been intentionally vague about where my Thanksgiving trip took me. That does not mean I don’t want to talk about it, but I can’t put some things in print for the sake of the family I visited. I am very eager to talk about my trip and would love to answer any questions you have. Please feel free to call me so that I can fill you in on how God is working in this spiritually difficult place. 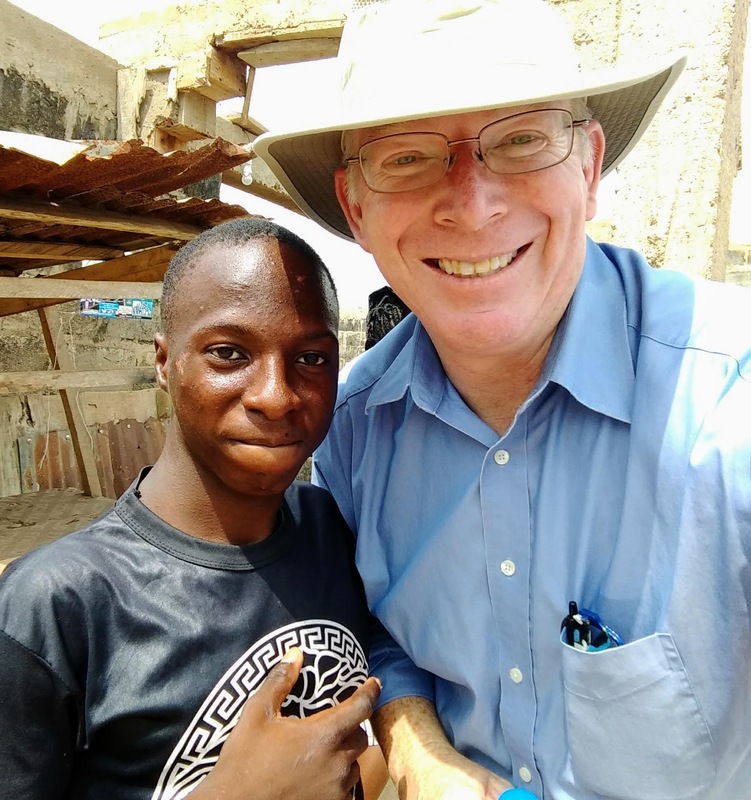 As my prayer letter is limited to a page that can easily be printed and posted to a church wall, I decided to include more details of my 2018 trip to Nigeria in a few different blog posts. If you would like to know more about my trip than what the December 2018 Prayer Letter contains, then read on. I was privileged to preach in the Independent Baptist Church of Festac in Lagos. This was their Thanksgiving Sunday. Testimonies and thanksgiving were given by each family that day. Particularly of how they had seen God work in their family over the course of the last year. One of the encouraging testimonies for me was something that started nine years ago. One of the assistant pastors in the church talked about prayer and how he was thankful for 2 Thessalonians 3:1-2 and how it teaches us to pray for the work of God. He said that he is regularly reminded of those verses when he prays for missionaries and other people in the ministry. The reason this testimony was particularly encouraging to me is that he said I preached on those two verses when I was in their church nine years ago. It is always surprising and humbling to me when people remember something I taught on. Even more so when it has been almost a decade and the person thanks you for teaching them how to pray. One of my joys on this trip was to see a friend named Shola. When we met in 2009 Bro. Shola was a hired sign language interpreter for Bro. Wale. At the time Bro. Wale did not know signs and was just starting to help the deaf churches. Bro. Shola was a school teacher and the son of deaf parents. He knew signs well, but seemed to not be so sure about working with the missionary. Fast forward nine years and Bro. 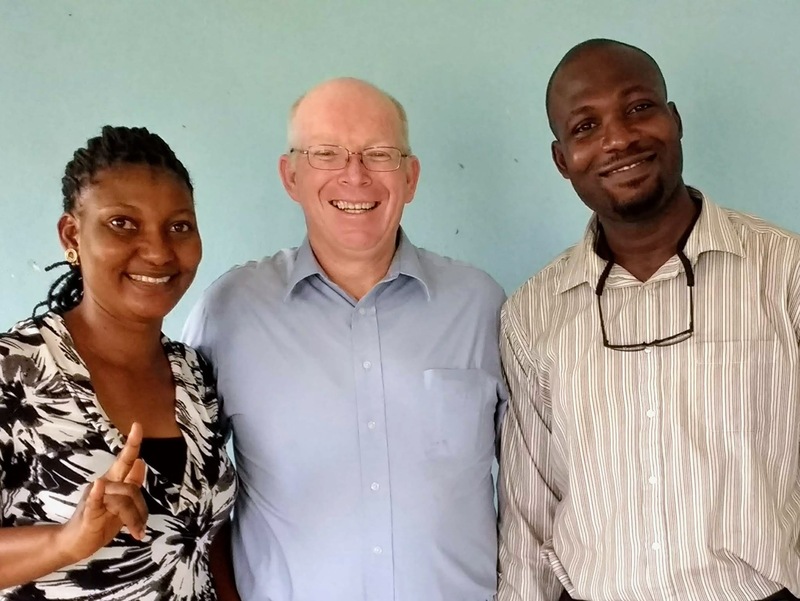 Shola is now the director of a new Christian deaf school. He is treating his 32 young students as his flock to pour his life and ministry into. Shola is fully surrendered to pastor the people God has given him. While they are primarily young school students, he also is reaching out to start a church among the Deaf in their town. We heard testimonies of students who have been saved. One has been used by God to lead his hearing Muslim mother and other family members to the Lord. Another pair of siblings who have been saved and are asking questions on how to tell their Muslim parents of the need for salvation. After that I was asked to preach and one young lady (maybe 16 years old) accepted the Lord after I gave a simple salvation message. There are five deaf churches in Ogun state that were started by the late Pastor Peter Ashade. Bro. Ashade was Deaf and used by God to see many Deaf saved and churches started. I was privileged to preach in all five of these churches. The first of these churches that I preached in was in Abeokuta. There were 40 or so Deaf there and Samuel, a 20 something deaf man, came to be saved. I look forward to hearing from Pastor Adelu about the growth of Samuel. I got a day off to rest at home before preaching at two deaf churches on a Saturday. The church in the morning was in Ilaro. About 20 attended the service and we had another young man saved, Akeem. He seemed to be very new to the church. I trust he will become faithful and grow in the Lord. We moved to the church in Ota in the afternoon. Again we had about 20 Deaf who came to church. We did not see anyone saved during that service. This church has bought property and are building the church a block at a time as the Lord provides the funds. Again on Sunday I preached at two different churches. The first church was in Sagamu. This is a church that does not have their own property, but it was the largest congregation by far. There were at least 80 people there that morning. They have graciously been granted space to hold their church services at a government school for the Deaf. Many of those in attendance were children from the school. There were three deaf ladies saved that morning. In the afternoon we went to the deaf church in Ijebu Ode. Another smaller group of about 20. Two deaf ladies were saved in this service. One thing that encouraged me about this church is that they are holding Bible studies in another town in hopes to start another church. Their Bible study has 35 to 40 regular attendees. The new town they are going to has an estimated 1,000 Deaf in the town. That is a larger deaf population than in Ijebu Ode. 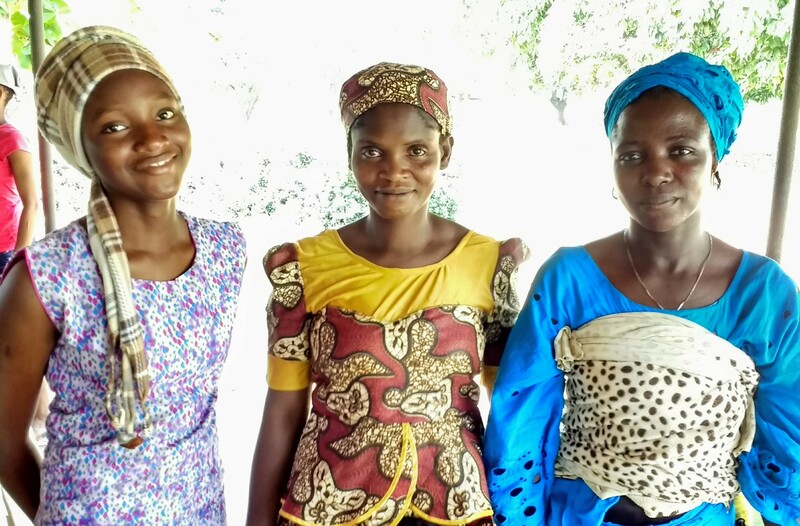 Pray for the church in Ijebu Ode that they will follow the Lord’s leading in this new work. Those are the six deaf services and one hearing service that I was privileged to preach in during my trip. I’m certainly not an eloquent speaker, but I thank God for the privilege of sharing His Word as I travel. I pray that He will continue to show me how to present the Gospel in a simple way that is accurate and understandable. I arrived home from Nigeria safely. Now to try and get my internal clock back to normal. Since I woke up at 4 this morning, I have extra time to type out a funny story that happened on my way home. I arrived at the airport in Lagos with enough time to check in. While that is always good, it wasn’t a guaranteed situation. My friend Wale only lives 14 miles from the airport, but it takes anywhere from 1 to 2+ hours to get there. Since we made pretty good time getting to within 10 minutes of the airport, we decided to stop at Domino’s Pizza for supper. When we left there we had almost 45 minutes to make the 10 minute drive. Traffic from the pizza place to the airport wasn’t that bad. However, in the airport drop off area we sat in a line about 1/4 mile away from the airport staring at red tail lights and not moving very quickly. Though I had checked in online I still had to turn in my checked bag and get a boarding pass. During online check in they emphasized that the counter to do that would be closed 2 hours before the flight. When I only had 5 minutes left of that 2-hour window, I jumped out of the car, grabbed my bag, shook Wale’s hand and darted for the airport. Though I would have liked a hug and a proper farewell, this seemed to be the best course of action. I made it through security fairly quickly. Yes, you have to go through a metal detector, physical pat down and have your bags run through a scanner just to walk into the door of the airport. I even found the counter to my airline and was pleased to see workers still there. However, there were no other passengers around. Apparently they heeded the 2-hour warning and came a bit earlier (or they were still stuck in traffic). Check in went well and I was relieved to have almost 2 hours to work my way through immigration and security. At the first immigration checkpoint the officer took my passport and boarding pass and actually acted pleasant. Immigration officers have never been anyone I have tried to joke with since the incident when I was 16 years old and I insisted to a US immigration officer that I was a citizen of Texas and not the USA. He didn’t appreciate the joke and I have been all business with those guys since then. Again he laughed and let me through after checking out my passport. Now, before you think I’m saying something inappropriate, let me explain the name. Baba is a common title of respect in many African and middle eastern countries. It has an Arabic background from what I understand. It just means father, elder, respected old man, etc. The dudu part is what sounds weird. In Yoruba, the strongest language around Lagos, it means black. As in color. It can be used to refer to a person’s skin color like we do in English. For whatever reason, one of my friends, from my first trip to Nigeria 9 years ago, started calling me Baba Dudu (black father). He did it again this trip and it seemed to be enough to entertain the immigration officer for a brief moment. Maybe some of them do enjoy a little humor now and then. By the way, I never explained to my Nigerian friend what the word that sounds like dudu in English means. We’ll just keep that to ourselves. When the year starts to come to a close everyone seems to be amazed that it is almost over. I’m not sure why we are surprised by that every year, but we are. And, so here we are again towards the end of another year. Due to visa delays I haven’t taken my trip to Nigeria yet. However, it has been rescheduled for the end of November. I will be visiting a missionary family in a closed country for Thanksgiving before making my way to Nigeria for 10 days. I’m very pleased to celebrate Thanksgiving with a family who lives in a spiritually difficult field. I am praying that I can be an encouragement to them. Thank you to those who have given funds for my trip to Nigeria. God has supplied the need through you. Putting off the trip by a couple of months has also helped with the finances needed for the trip. 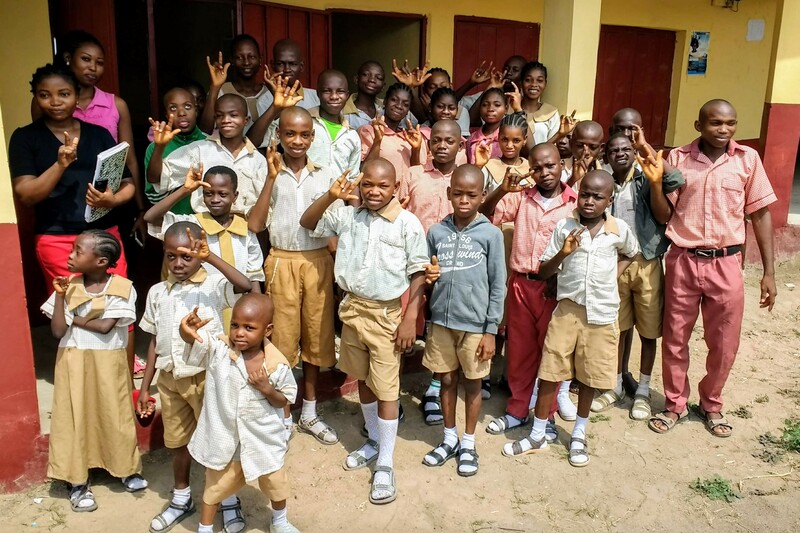 As you may recall, the purpose of my trip to Nigeria was to be there for deaf camp. While I hated missing the camp, I was very pleased to hear that many were saved during the week. I believe the number was 38 salvations. A celebration of the life and ministry of Pastor Peter Ashade (a former BIO missionary who died 12 years ago) will be held while I am in Nigeria. Bro. Ashade, Deaf himself, started several churches for the Deaf. On my last trip to Nigeria I visited the 5 churches he had been pastoring when he died. Bro. Wale Orekan, a Nigerian national and missionary to the hearing, got involved with the deaf churches. He has been training deaf men to be pastors in those churches and to start new ones. I am honored to be back in Nigeria to celebrate what God has done through Bro. Ashade and Bro. Orekan. 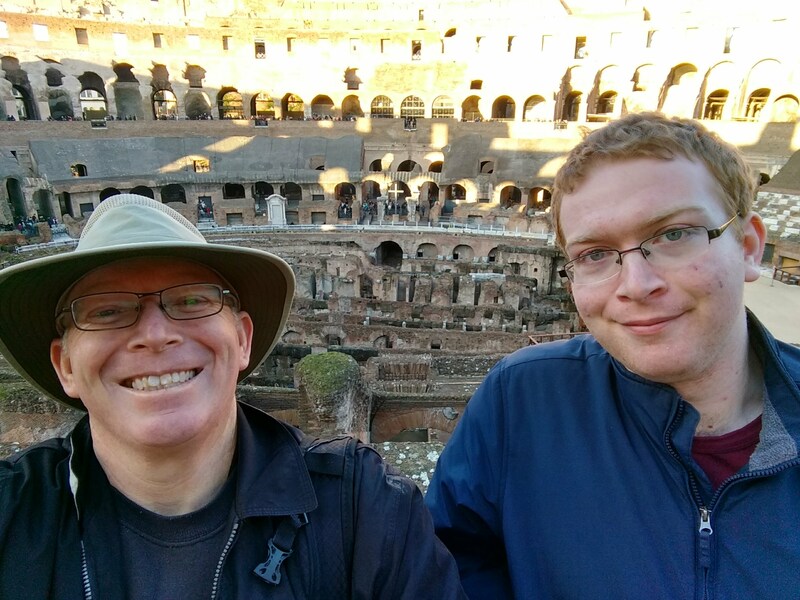 Since the last letter we have taken our son back to college at PCC, held a couple of individual training days with missionaries, and been involved with church missions conferences. It was our privilege to be with a deaf church in St. Louis that we had not visited previously. There were at least 4 unsaved Deaf at the conference. Though none of them made a profession of faith that week, I was encouraged to see the love that the church had for the lost. 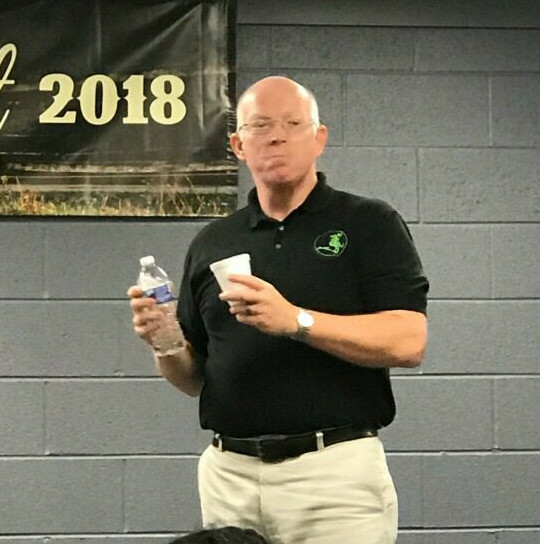 One of the men in the church was so passionate about seeing his friends saved that he was in tears as one lady continued to refuse to accept God’s forgiveness. This exchange was an encouragement to me and I trust that we will soon have news of her salvation. Before the trip to Nigeria we have meetings in Atlanta, North Carolina, and the Washington, D.C. area. In North Carolina I will be visiting Ambassador Baptist College once again. Their missions conference is always a blessing to me. I trust that God will use me and the other mission board representatives to be an encouragement to the students concerning their involvement in world missions. You can download a PDF version of this letter for printing. Thank you for your continued prayers and financial support. As mentioned in my last letter, I have some computer and networking projects I’m working on in the office. Thankfully, God has helped me complete one of them. I attribute that to your prayers and help from good friends. Even though some of these projects seem to be outside my abilities, I am encouraged by the completion of this one. During the last three months I have preached more than usual in churches in our area. I was thankful for each opportunity. This included a couple of services in a deaf church and being a “warm up” speaker for a church heading into their missions conference. I also helped with some interpreting during revival services where my friend Ronnie Rice was preaching. 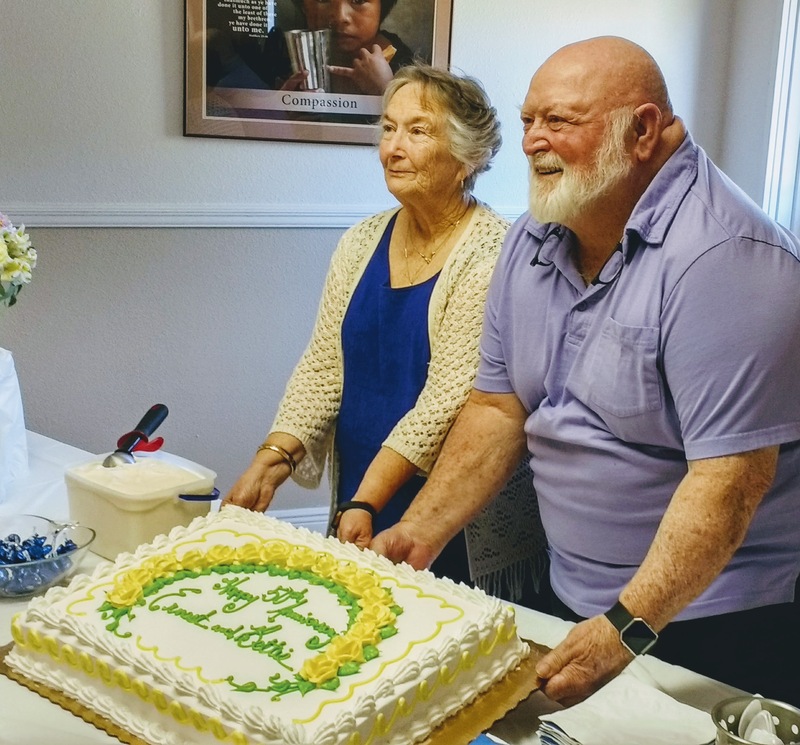 April marked my parent’s 50th wedding anniversary. My two brothers and their families were able to join Stephanie and me as we celebrated Mom and Dad’s 50 years together. I don’t say it often enough, but I am thankful for the good parents God has given and the example in marriage they have been for our family. My best friend during my high school years was my youth pastor, Phillip Winn. He later pastored in Arkansas, Oklahoma and Texas while I have ministered in several places. We’ve not lived close to one another, but we stayed in touch for the 30 years we’ve been apart. Bro. Winn passed away in July. The church he was pastoring in Abilene graciously invited me to spend Memorial Day weekend with them for the purpose of honoring Mrs. Winn as she is preparing to move away and minister to her aging parents. While I was in West Texas I got a chance to preach at our sending church and visit friends and family. I will be headed back to the Bill Rice Ranch this summer. I am honored to work alongside Ronnie Rice, Allen Snare and all the staff at the Ranch for 4 weeks of camp. It is a wonderful evangelistic opportunity. There are Deaf who will be at the Ranch this summer who will understand the Gospel for the first time. Please pray for the four deaf weeks starting June 11. Along with being at camp this summer, we are gearing up for our annual Training School with our missionaries. We have three families who will be with us this year. One works with the Deaf in South Africa. One family has worked with the Deaf (in Peru) and desires to get a new ministry started with the Deaf in Italy. The third family is headed to Haiti as hearing missionaries. After training school we trust they will go to the field with a desire to equip people in their church to carry the Gospel to the Deaf around them.